The effect of the rotation of a very good conducting cylinder on the backscattered field will be investigated where the incident wave is considered as a plane wave in both polarizations (E-wave and H-wave). Previous work has explained that rotation or vibration of the object may induce phase changes of the scattered signal. Modulation during rotation or vibration is referred to as micro-Doppler effect. Also, the effect of the rotation of a conducting cylinder was investigated by many researchers in the past using the Galilean transformation. 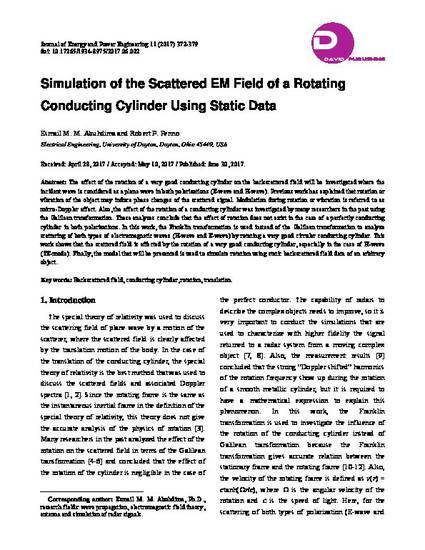 These analyses conclude that the effect of rotation does not exist in the case of a perfectly conducting cylinder in both polarizations. In this work, the Franklin transformation is used instead of the Galilean transformation to analyze scattering of both types of electromagnetic waves (H-wave and E-wave) by rotating a very good circular conducting cylinder. This work shows that the scattered field is affected by the rotation of a very good conducting cylinder, especially in the case of H-wave (TE-mode). Finally, the model that will be presented is used to simulate rotation using static backscattered field data of an arbitrary object. This document has been made available through the publisher's policy on open access.